Cheer on your Oregon Ducks in this Justin Herbert Nike Oregon Ducks Men's Replica Jersey - Black from Nike! 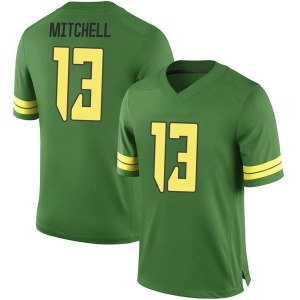 Cheer on your Oregon Ducks in this Dillon Mitchell Nike Oregon Ducks Youth Replica Football College Jersey - White from Nike! Cheer on your Oregon Ducks in this Dillon Mitchell Nike Oregon Ducks Men's Replica Football College Jersey - White from Nike! Look like the most passionate Oregon Ducks fan in the country with this Dillon Mitchell Nike Oregon Ducks Men's Game Football College Jersey - Green from Nike. 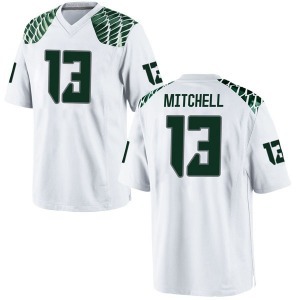 You'll feel like you're in the middle of the game when you put on this Dillon Mitchell Nike Oregon Ducks Youth Limited Football College Jersey - White from Nike. Cheer on your Oregon Ducks in this Troy Dye Nike Oregon Ducks Men's Replica Football Jersey - White from Nike! You'll feel like you're in the middle of the game when you put on this Matt Wogan Nike Oregon Ducks Men's Limited Jersey - Black from Nike. You'll feel like you're in the middle of the game when you put on this Matt Wogan Nike Oregon Ducks Men's Limited Alternate Football Jersey - Apple - Green from Nike. Cheer on your Oregon Ducks in this Justin Herbert Nike Oregon Ducks Women's Replica Football Jersey - Gold from Nike! 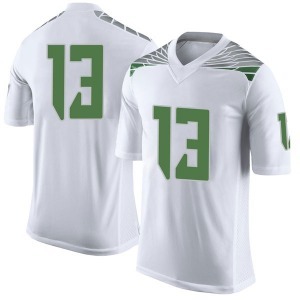 Cheer on your Oregon Ducks in this Justin Herbert Nike Oregon Ducks Youth Replica Football Jersey - White from Nike!